With so many figures and trinkets being announced, it's easy to forget about Bandai's 66 Action Rockman figures. If that's you, duly take note: they're due to ship next week around April 18th. 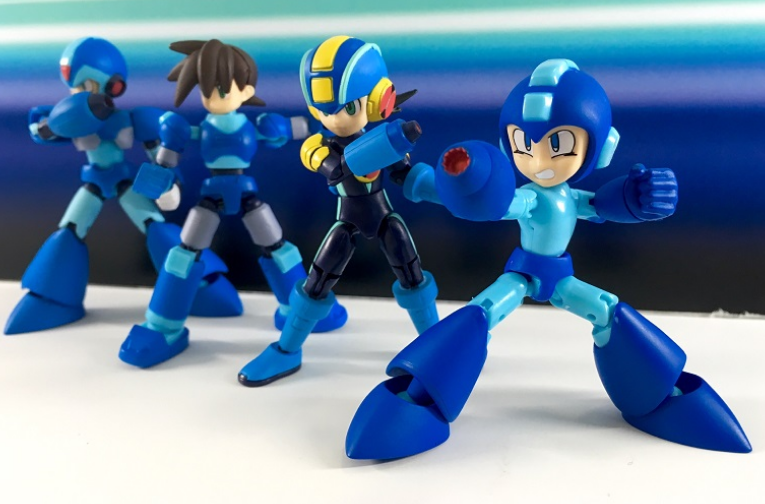 The line consists of four 66mm/2.5 inch mini figure: classic Rockman, X, EXE and Volnutt. Each character is accompanied by one tiny accessory. Pre-orders are still available from Ami Ami and Big Bad Toystore. Be aware, these are trading figures - you won't know which character you'll get. Might as well rename this series to G.I Joe Man. You know it's sad when freaken Naruto is more of a Video Game franchise than Mega Man. I'm less interested in this line since we're getting all of these guys as 4-Inch-Nels. Granted, they're half the size and a good bit cheaper, but until we get these at US retail, I'll pass. Sorry, Mega Man. I don't care how neat your merchandise is; my boycott remains as strong as ever. See ? They wants our money and not Capcom cares to make a new games. SIGHING. I'm sorry, but what the heck are you even trying to say? Don't worry, he's been infected with the Sigma Virus. When did it become a requirement that any and all "classic" mega man merchandise is required to wear guy liner? I'm way more interested in these than the 4 once nel line. I liked how these looked a lot & their accessories they showed off. I don't understand why people get so upset about capcom not making new megaman games. Keiji moved on so he wouldn't be part of any new games and capcom doesn't seem to care about megaman. Best bet would be Nintendo making one instead of capcom. people say "capcom" because as far as today, the people owning megaman are still capcom, so the people who could (but are not) decide to make new games are capcom. and you'll see as much people saying "capcom should sell Megaman if they're not going to do anything with him." "Nintendo" LOL are you people delusional... Maybe you guys are hopped up on some sort of Switch or Zelda hype, but Nintendo is absolutely not better for Mega Man than Capcom. There are only two things they could possibly do better, generate more interest because they have more power in the industry, owning the souls legions of fanboys and press media, so maybe they will pump out a single release a console generation which had better had sold over a million units, more depending on the budget it took to create it, something the MM brand rarely does, or else.... Here's the problem with that, Nintendo's fanbase is large but made up of existing fanboys of other brands, fanboys that think competition even among Nintendo IPs are a threat to their favorite franchises, so essentially Mega Man would be competing with much stiffer competition. Or Nintendo could bury Mega Man, and protect its corpse which could prevent things that drag the MM brand through the mud, (like that retarded 2018 cartoon). The bad side of that would be ... well... MM would be dead. If Nintendo owned Mega Man we'd be lucky to get one new Mega Man game per console generation, literally lucky. Nintendo owning Mega Man would be no different from Capcom. No games, except the fanbase would be destroyed by constant C&Ds. JusteDesserts is right about the C&Ds. Capcom doesn't send C&Ds letters like Nintendo and Square-Enix, at least. It would be far worse for the fanbase if Nintendo was in charge, even the fangames wouldn't be safe. There are some companies that could probably give Megaman more love than Capcom, but Nintendo is not one of them. The C&Ds are definitely a concern. If Nintendo can make something that was once as small as Fire Emblem work eventually though, I think they could definitely make Mega Man work. That said, I would prefer it to go to Bandai Namco first, personally. since we did not get a megaman game since the nintendo DS, one game per console generation would STILL be more than what capcom is doing. that said, i don't think nintendo owning megaman would be the miracle solution. for some of the reason mentioned above. (AnonymousApril 11, 2017 at 1:37 PM, you seem to have huge problem with nintendo and nintendo players, though. it would not be good, but it would not be THAT bad either). i think people got carried away by how well megaman was looking in Smash bross (switch hype have nothing to do with it, this argument have been arroung since smash), but let's not forget the inclusion of MegaMan in smash did not magically happen, Capcom had to collaborate with nintendo to make things works. Fire Emblem was a fluke, it had perfect timing to be popular since there is so little variety on the 3DS for the 3DS, like people have said Pokemon, Zelda, Mario/spin-offs, and to a lesser extent Monster Hunter, Kirby maybe DQ(with a single exclusive I think with DQMJ3) are basically it. Even then, early in the 3DS' life it was even more barren, excluding ports or remakes pretty much Mario, Kid Icarus, inevitable Pokemon, MH4, Bravely Default, and uh.................SMTIV(?). It was also a desperate time for Fire Emblem, with creators outright saying that it was their final push for the brand to succeed, and they went all out. Even with all that it took Nintendo essentially killing off the Wars (Advance Wars) series to push FE. Maybe Mega Man would be better off at Namco then. Considering that company puts out a Tales game every other quarter (kind of joking, kind of serious), that might work in the Blue Bomber's favor more. I just want Mega Man and X. I don't care about the other two characters. But with my luck, I'll end up with 5 Volnutt and 6 Megaman.EXE before I get X or classic Mega Man. Toys r us usa ohio canton just got some in.